I’m back in flat Florida. It’s nice to have running water again. It’s nice to be sleeping in a place where I can sprawl. I’m trying to be positive, but it’s hard not to miss those gorgeous mountains and those glorious Fall colors. I’m not going to go into detail about my vacation. The last time I did that, my older daughter refused to read that week’s blog post. She had already been subjected to our vacation stories and our vacation pictures. I’m going to give her a break and talk about creativity instead. I have something exciting to report. 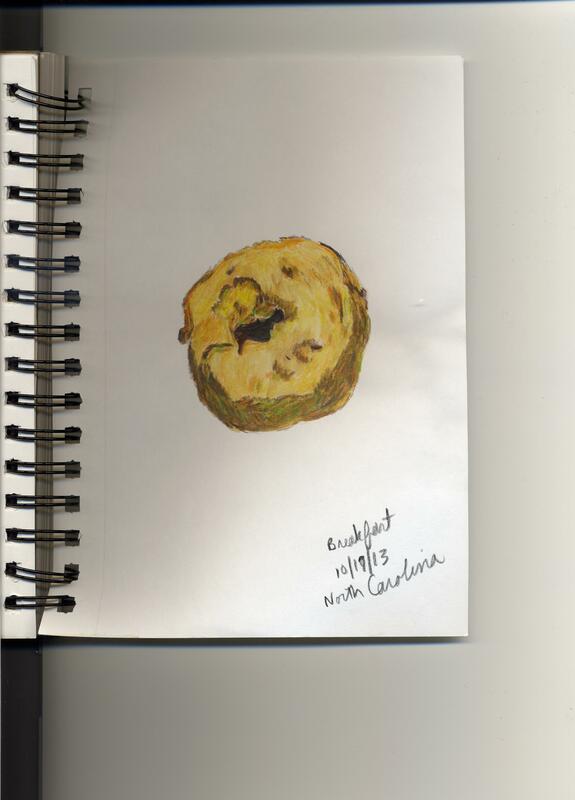 I did a drawing every single day while I was in North Carolina! 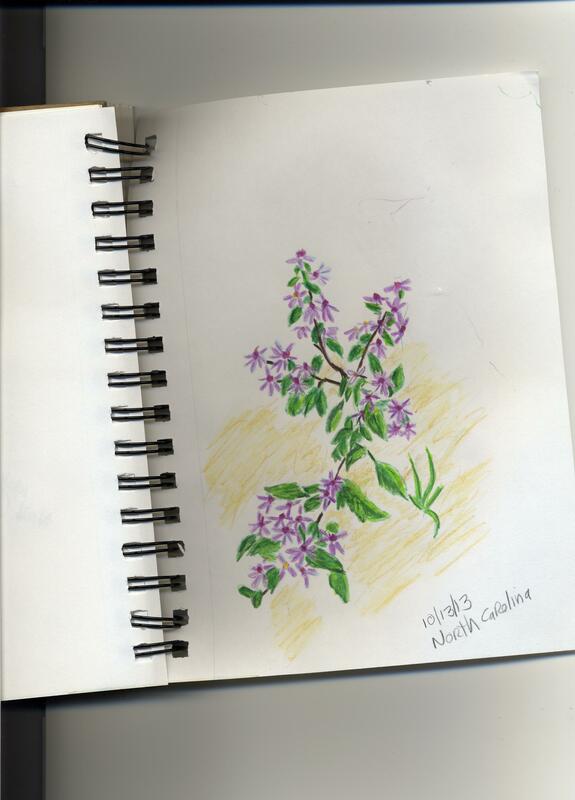 I started with the first thing I saw when I stepped out of my car on our hillside campsite – some pokeweed berries that very nearly hit me in the face. The berries were bright green but their stems were magenta. I was using my set of twelve watercolor pencils, so there was no way I could capture those colors perfectly, but they were so startling that I had to try. Once I had done a drawing the very first day we arrived, I started to think I might be able to do one every day. I was surrounded by breathtaking natural beauty, so I had no excuse not to try. 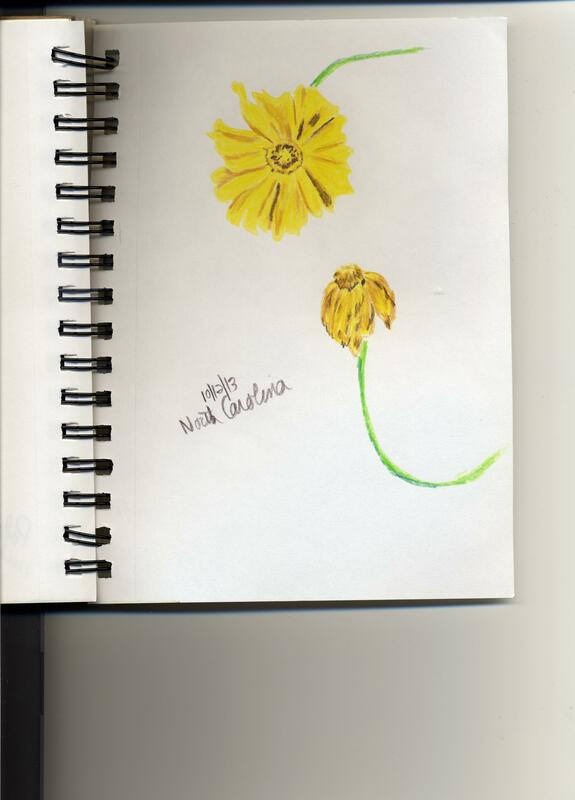 The next two days I chose wildflowers that were growing on the hillside and I was reasonably happy with those drawings. 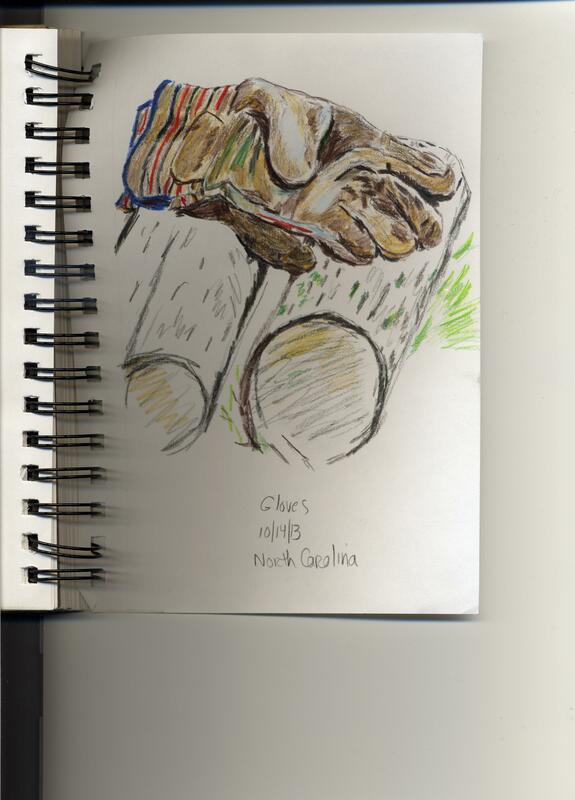 Then I tried something different: a pair of work gloves lying across some cut firewood. This was so much more difficult than the little bits of flora I had done the first three days, I wanted to give up in the middle of it. The perspective was all wrong; the gravity wasn’t working…my inner critic was going on and on about how horrible this little drawing was. I’ve tried doing a drawing a day before. Then I would reach a point like this and my inner critic would start telling me that I had no talent and it was never going to get any better and I might as well give up. Every other time, that was exactly what I did. Not this time. I did go back to flora. 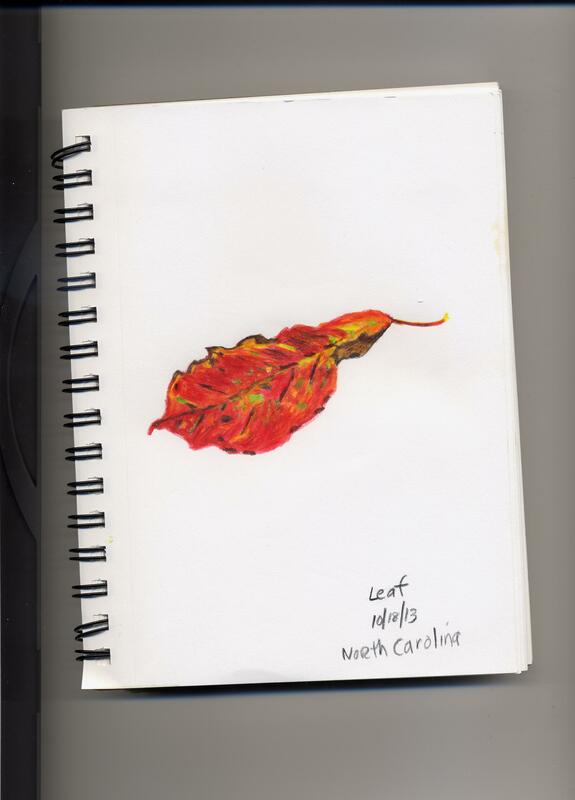 I chose a small, pretty leaf in colors that were readily available in my tin, but I kept going. One more day, one more drawing, no quitting. Go me! 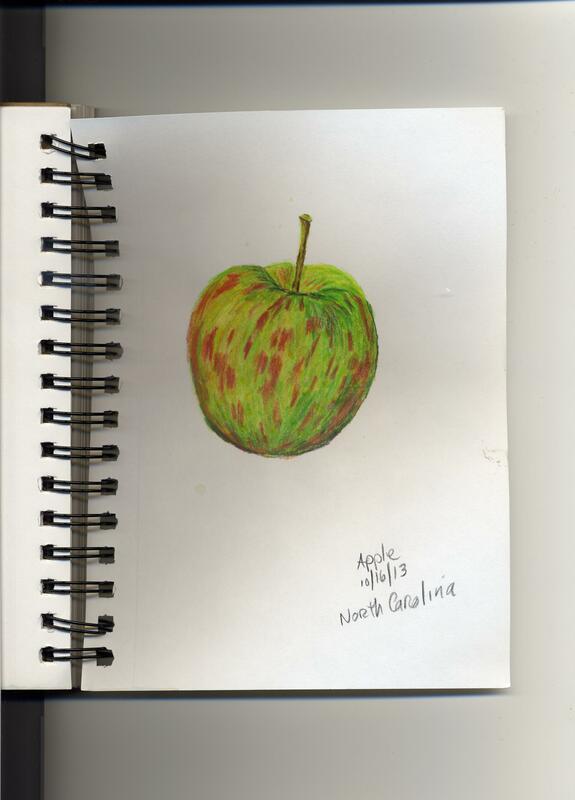 The following day was our day to visit an orchard, so that day I drew an apple. I like this one a lot. Smooth, round fruits are easy. Maybe too easy. The next day I had the nerve to think I might be able to draw a doughnut. My tin had no browns except dark umber, but I did not let that discourage me. I had no idea that all the nooks and crannies of a doughnut make it an entire world on your plate – a world you must draw before you can eat. My inner critic got loud again that day, so the next day, I went back to flora. 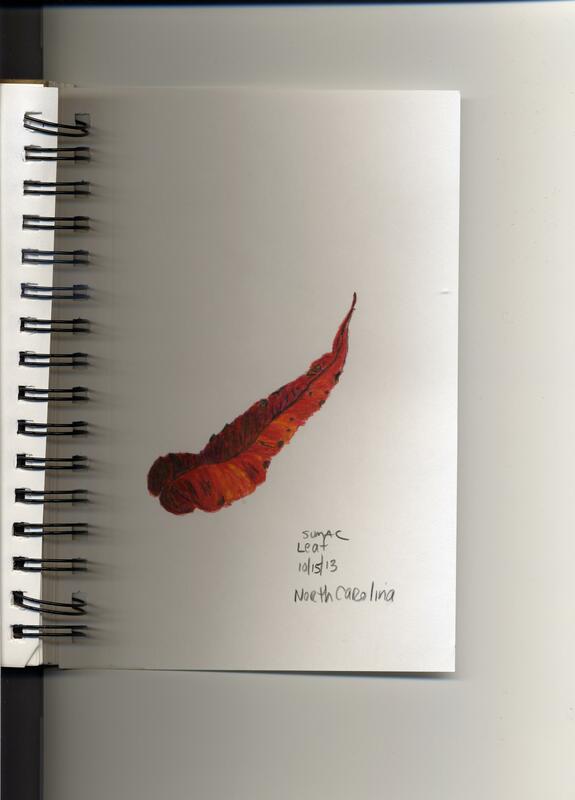 One more Autumn leaf makes eight drawings to add to my list of fifty things. Actually, nine. 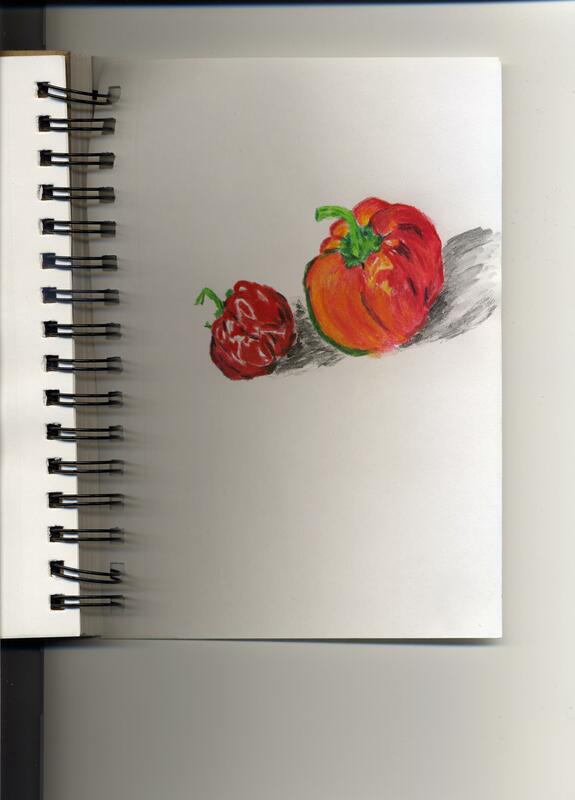 I had drawn a couple of peppers before I left home. I forgot to date the drawing, so I’m not sure when I drew it, but it was definitely during my sixtieth year, so it counts. 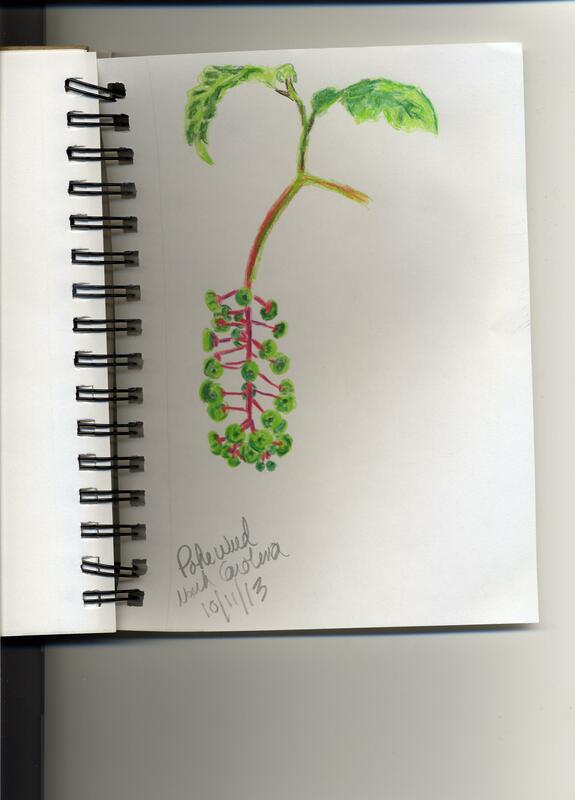 This entry was posted in Uncategorized and tagged creativity, daily drawing, inner critic, vacation, watercolor pencils on October 20, 2013 by releaf1954. I promised at least one blog post per week and I’m feeling rather compulsive about doing that now that I’ve made the commitment. I’m on vacation this week, but I brought my little netbook in hopes of having wifi access during our one hotel night. This is the night, but the access is giving me problems. I’m vacationing with my I.T. Guy husband, so I hope he can help me resolve these problems. 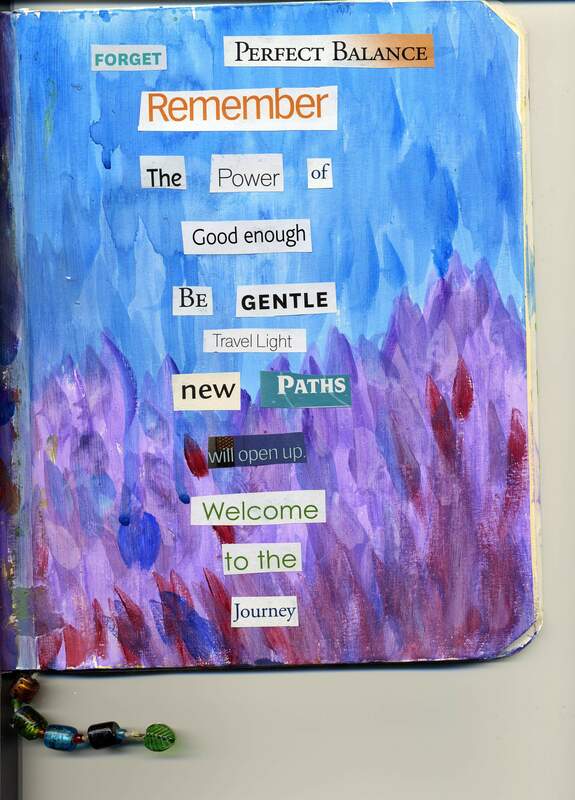 I have no clue, but if I’m going to keep up with my blog, I need to learn how to cope. I.T. Guy just tried connecting his own laptop to the hotel wifi and he said it connected right up. I don’t want to think my netbook is a lesser computer. I love my netbook. Catch me in an unguarded moment and you might hear me call it “the precious.” It’s cute and it’s blue and it’s so small I can slip it into a backpack or suitcase and take it just about anywhere. It’s not fast. Okay, it’s really slow, but that doesn’t matter because I didn’t buy it to use as a game machine. I bought it to use as a portable word processor and for that, it’s perfect. I had to have a portable word processor. My daughter had convinced me to do NaNoWriMo last year and there was no way I was going to write fifty thousand words in a month while sitting at a desktop computer. Sitting at a desktop computer feels like work. I wanted NaNoWriMo to feel like play, so I got myself a new toy. With this adorable little toy, I could sit in a soft chair or my favorite corner of the couch and work on my novel in sweet comfort. As it turned out, I caught a nasty virus last November and ended up doing a lot of my typing in bed. 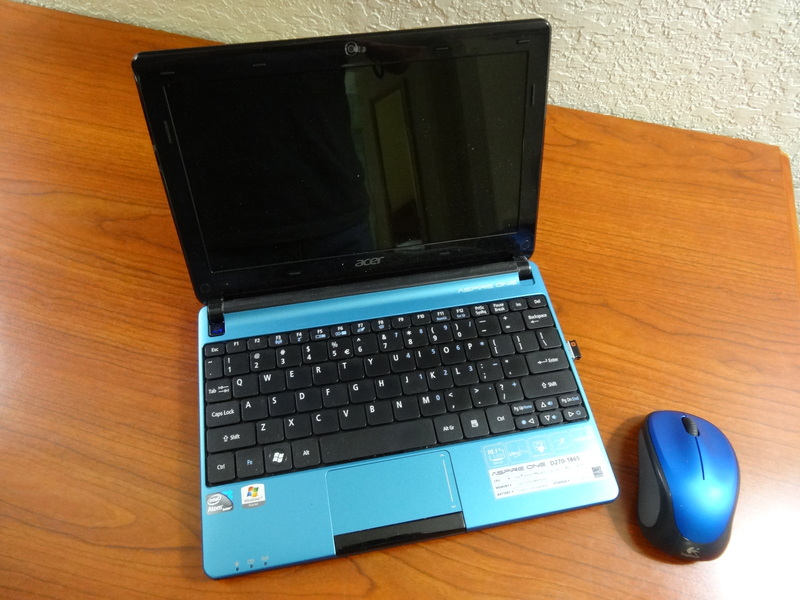 If I hadn’t bought this netbook, I never would have been able to complete my novel. It may be pokey, but it saved my NaNo novel and I am grateful. Now I’m preparing for my second NaNoWriMo. When I say I’m preparing, I don’t mean that I’m making outlines or planning chapters. I did NaNo by the seat of my pants last year and I imagine I will do the same this year. My preparations involve laying in a generous supply of Maxwell House International Coffee and Oregon Chai. I know what tools will get me through NaNoWriMo. That doesn’t mean I haven’t been thinking about a new toy this year. I already have the perfect little computer, so I treated myself to a new flash drive. 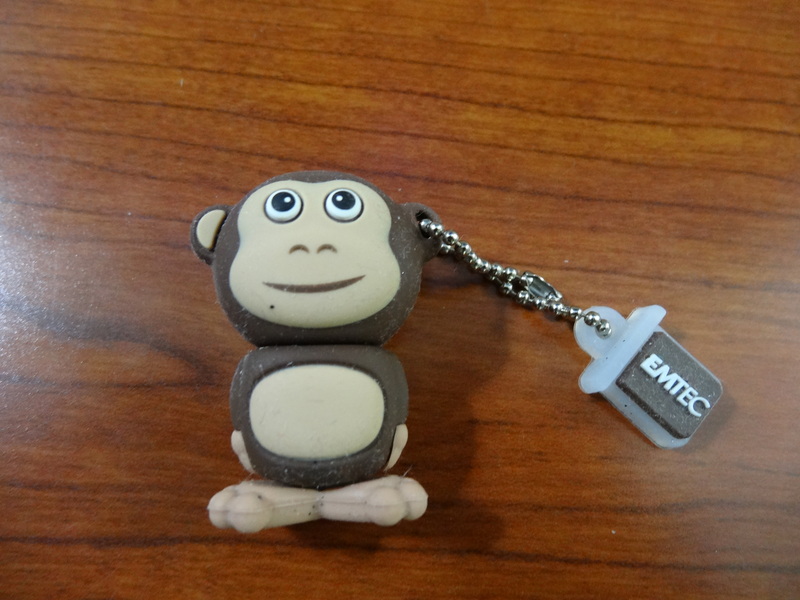 A monkey flash drive. This entry was posted in Uncategorized and tagged NaNoWriMo, netbook, travel, writing on October 16, 2013 by releaf1954. I’m having a busy week, but not a creative week. I’m preparing for a trip to the mountains. My husband and I own a small piece of property in North Carolina. We love our little hillside, but it has no improvements other than a driveway, so that means we’ll be camping. When this man agreed to spend a lifetime with me, I was a young woman who loved camping. I hate to be a party pooper now, but I am getting way too old to sleep on the ground. 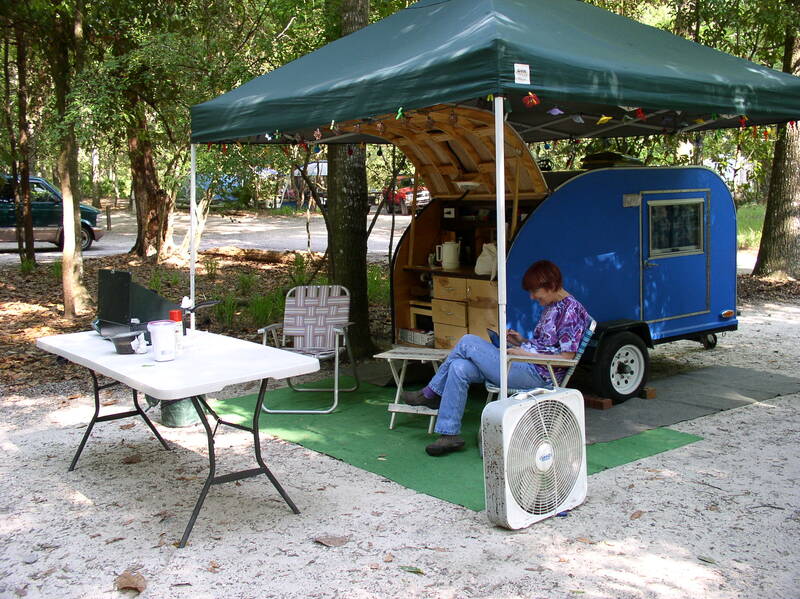 That’s why I’m delighted that my husband built a tiny teardrop trailer for us to sleep in. We used to own a fairly large RV, but it was so big that we could hardly ever afford to take it anywhere. Even when we could afford the gas, there was no way either of us was going to drive it on those twisty mountain roads in North Carolina. Okay, there was no way I was going to drive it under any circumstances, but even my much braver husband was not going to drive it up there. We would travel light and bring a tent. I tried to be a good sport about it, but it was a lot of work and in October, it was way too cold, even on an air mattress in a down sleeping bag. I was chilled to the bone the last few times we took a tent to the Blue Ridge Parkway. When we got in the car to go sight-seeing, I would crank up the heat until my poor husband was sweating and I still did not feel warm. This led to expensive extra hotel nights. With Jacuzzis. The teardrop was the perfect solution. We first saw them on a show called “RV Crazy” on HGTV and we immediately recognized their quirky owners as kindred spirits. My husband started lurking on a forum which provided guidance and step-by-step instructions for building a teardrop trailer. There were plans you could get for free and there was a whole community of helpful people who would answer questions. My husband bought a small metal utility trailer and got to work. He kept asking me how I wanted it to look and I kept saying the most important thing was that it had to be cute. I absolutely love this little trailer. The walls are insulated, so it’s toasty warm even when the only heat source is two human bodies in a small space. It has tiny cupboards over the bed inside for our personal things, and it has a whole galley in the back. My wonderful husband made all the shelves and drawers himself. He asked me to pick out the blue paint for the outside and then I made tie-dyed curtains to match. We took it to the Blue Ridge Parkway before it even had all its cupboards and we just loved being up off the ground when we were camping. We started taking it to folk festivals, which was so much fun I ended up writing a yodeling song about it, and now that we have land in North Carolina, we take it there and make ourselves at home in it for a week. It has a sturdy RV battery that keeps the lights going when we’re boondocking and the galley holds all the tools we need for fixing meals and making coffee. Coffee is important. Ask anyone who’s seen me before I’ve had my first cup in the morning. The RV was too big and the tent was too small. 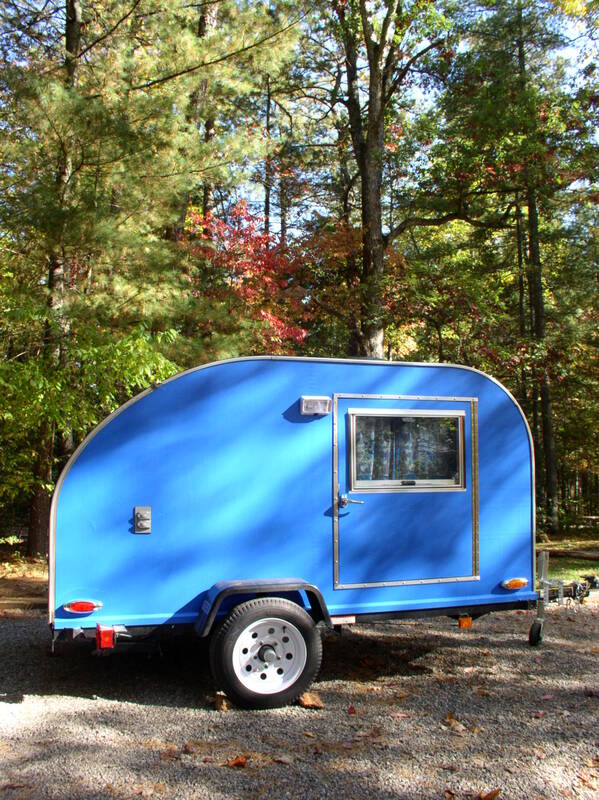 Our little blue teardrop trailer is just right. This entry was posted in Uncategorized and tagged Blue Ridge Parkway, camping, North Carolina, teardrop trailer, tie-dye on October 10, 2013 by releaf1954. This has not been a creative week for me. It started with inventory. 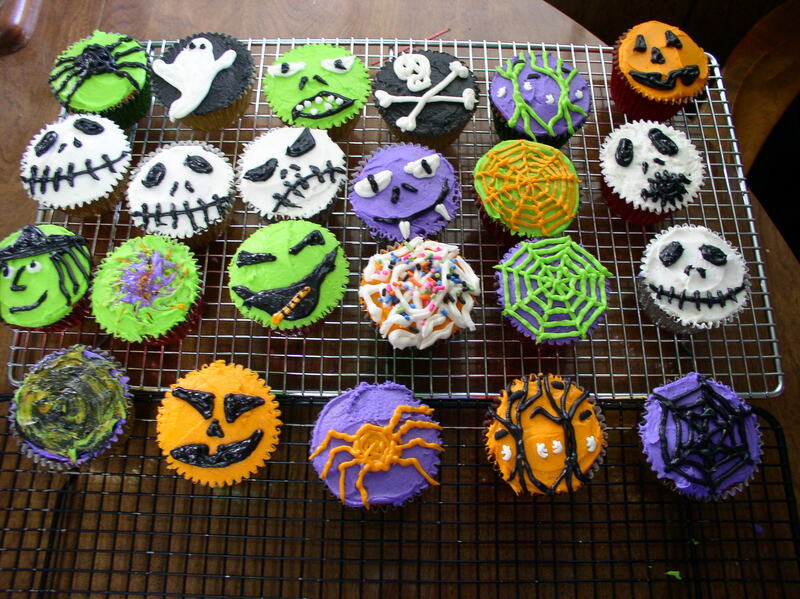 We count everything four times a year because the thought of just doing it once makes me nervous. I don’t want that much time to lose track of things. The tie-dye business has creative elements, but inventory is not one of them. Once we got the inventory to balance, we started preparing to take the tie-dye to the local arts market, which kept us pretty busy until Saturday, which was our market day. I guess there were some quiet times during the week when I could have done something creative, but I didn’t. I don’t know why. Sunday arrived and I knew I was going to need to come up with a blog post and I was really hoping I could do it before bedtime this week. I was also hoping I could come up with something creative to do before blogging, so I would have something to add to my list of fifty things. The problem was, I couldn’t come up with any creative inspiration, even after my husband went to my brother’s house to watch the Jaguars lose again and I had the house to myself for hours. I enjoyed the peace and quiet, but I did nothing creative. By the time my husband returned, I was getting desperate, so I turned to the one thing that never fails me – a pasted poem. I found my little box of words and got to work. I worked quickly, not just because it’s the best way to bypass the inner critic and my pesky rational mind, but also because it was already after six o’clock and bedtime was only a couple of hours away. I have to say, the process surprised me. I pulled out all kinds of words I thought would be relevant, words like “lost” and “secrets” and “age.” They caught my eye as I was starting out, but they ended up going back in the box. I thought I pulled out “perfect balance” because I wanted to find it, but my heart found a whole different message. It turns out I was not going to get to bed on time anyway. I had forgotten that the Simpsons “Tree House of Horror” show was coming early this year. 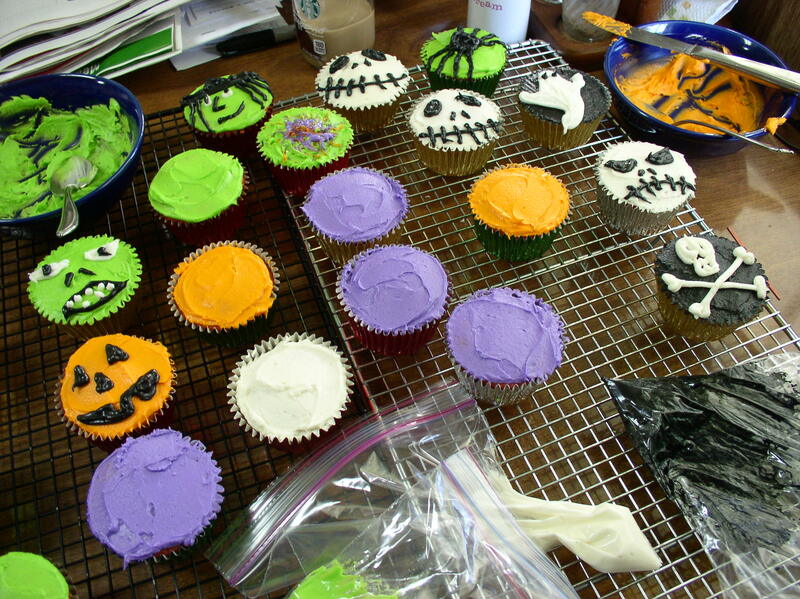 This entry was posted in Uncategorized and tagged creativity, inspiration, poetry on October 6, 2013 by releaf1954.